Our new design of capsule will save you £'s while being perfectly compatible with your machine. We’ve reduced the cost of the capsule so we can spend more on the coffee. Our coffee blends are carefully roasted in our Swiss state of the art roasting house then hermetically sealed within minutes of grinding to give you the freshest possible flavour. Each of our blends is distinctive. You can choose to suit your tastes and your mood. From strong, powerful flavours to lighter, more delicate tastes, there is a coffee here for you. The selection of beans and precise degree of roasting give each of our blends its own character. As a guide, the intensity of coffee is measured from 1 to 12, with 12 being the strongest flavour. Just select the flavour that appeals and add them to the cart. Each of our boxes contains ten capsules, individually wrapped and sealed in foil for maximum freshness. 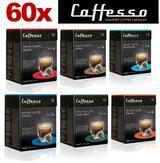 There are now many Nespresso compatible capsules on the market, many are aimed at being the cheapest. Well in coffee you certainly get what you pay for. Caffesso aim to provide an alternative to Nespresso without sacrificing the quality, and quality is the very reason why you bought a Nespresso machine in the first place. How have you made your espresso capsules cheaper? Our design does away with the aluminium foil which is expensive and concerns environmentalists. Our capsule costs less to produce and we pass the difference on to you. Will your espresso capsules work the same way in my Nespresso machine? Yes. Our capsules have been precision made by Swiss engineers and thoroughly tested on all Nespresso machines. They fit perfectly and work in exactly the same way. The only difference is that slightly more pressure on the lever may be required to break the seal on the capsule. Do you guarantee your capsules? Yes. In the unlikely event that you have any problem with our capsules, we will refund your money in full together with any postage charges that you may incur. Why are your capsules sealed in foil? With coffee freshness is everything. Sealing in the freshly ground coffee as quickly as possible means that it keeps its taste and aroma until you unlock them. Our roasters source coffee from around the world to get just the right blends but the majority of our beans come from south and central America, Africa and India. Is the coffee in your espresso capsules sourced ethically? Yes. We are naturally concerned that the quality of our beans is the best possible but we also help ensure that the quality of life of the communities that grow them is benefiting from their production. What does intensity level mean? 12 is the strongest coffee, 1 is the most delicate. We offer a range so you can select just what you prefer.